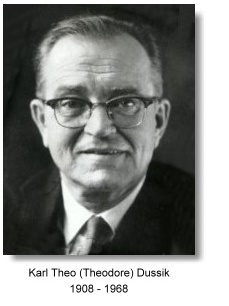 Dr. Karl Dussik produced the first diagnosis using venous ultrasound images of the brain. He called the pictures "hyperphonography". Born in Vienna, Austria January,9th, 1908 by immigrants from Czechoslovakia, he graduated from the University of Vienna in 1931. 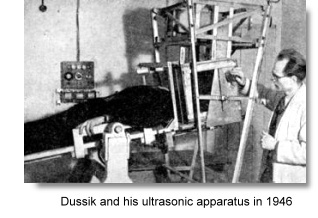 In the late 1930's Dussik, a neurologist and psychiatrist, working at the hospital at Bad Ischl, Austria and in the university of Vienna started experimenting with cranial ultrasound as a diagnostic tool. He tried to detect brain tumors,and he also was first to find abnormalities in the head, tissue, and body fluids. He used a method in which a transducer was placed on both sides of the patient and submerged in water. The patient's head was partially under water as well. They transmitted sound waves toward the patient at a known rate. The echos were then recorded on heat sensitive paper. These were among the first ultrasound images and the first to diagnose brain tumors. Later, Siemens Laboratory and researchers at Massachusetts Institute of Technology labeled the experiments as ultrasound artifacts, as in further experiments they found that the acoustic reflections and attenuation patterns in the skull were actually normal echos. Dussik first diagnosis was that the images were changes in the cerebral ventricles. However, his work was the basis of further studies and developed into a science.